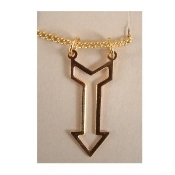 ARROW PENDANT NECKLACE - Valentine's Day - Cupid Love Jewelry - GOLD-tone Vintage 60's-70's charm. Approx. 1-1/4" tall on 18" Gold-tone Neck Chain with safety clasp.